The example that most people know is probably the text autocompletion that you see on web search engines: you start to write some letters in the search bar, and the search engine suggests complete words or sentences. I believe we’ll see an increasing number of “autocompletion products” tackle a greater variety of tasks that go way beyond text autocompletion. Driven by the democratization of machine learning, autocompletion software is getting smarter. In many cases, basic autocompletion is built on “brute force”. It’s the case when you type some letters and the suggestions displayed are purely based on the comparison with words starting with the same letters (it compares what you write with a dictionary). But now, thanks to machine learning, you see autocomplete suggestions that take into account the specific context and the user’s habits. It’s already the case on the major search engines which suggests keywords, and even complete sentences, based on what is popular at the moment, what other users are searching or even your search history. Another example is the recent Gmail text autocompletion feature which suggests part of sentences and not only single words. Driving. At the moment self-driving cars still need a human behind the wheel. This is why I consider this class of software in the “autocompletion” category: they help human achieve specific aspects of driving like parking, breaking in emergencies or driving on the highway. Creating music. Magenta is an open source project that helps people write music. Design objects. The field of generative software is booming: it suggests new product design based on the inputs of the designer. Developing software. Kite is a smart code autocompletion for developers. Drawing. Nvidia AI turns rough sketches into photorealistic landscapes. Designing presentations. Deckorobot takes your rough slides and turns them into a well-designed presentation. Legal. Ross helps lawyers conduct their research faster. What I want to show through these examples is that “autcompletion software” will impact an increasing number of aspects of our lives: online or “IRL”, for personal or professional use. 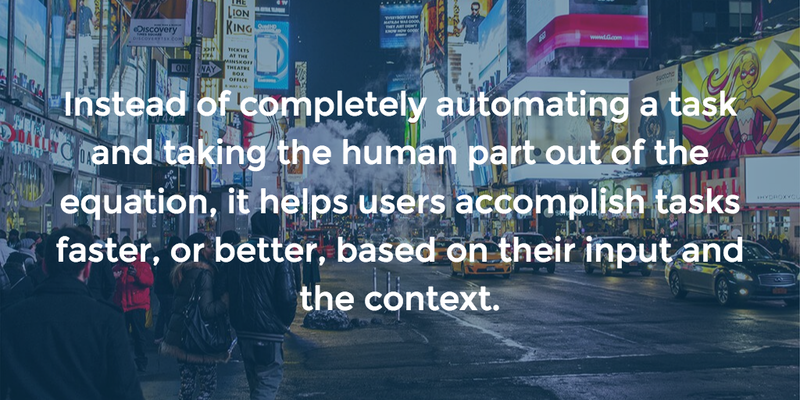 Whereas automation software often aims at replacing humans, software autocompletion aims at “enhancing” its users by helping them be faster, better or more creative. The latter is an important aspect as autocompletion might be tied to “standardization” (a.k.a people don’t think anymore, they’ll just use what the algorithm suggests). While this is true in many cases, I also believe that the use of AI combined with humans will unlock our creativity. A good example is how AlphaGo enabled professional Go players to think in entirely new ways.